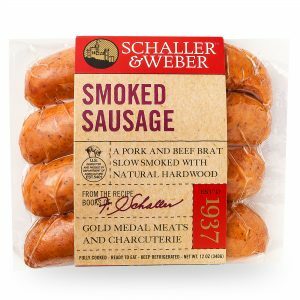 Schaller & Weber brings nearly a century of sausage making experience to this American-style breakfast sausage. We’ve combined the subtle sweetness of maple syrup with warm flavor and aroma of sage. It’s a contemporary breakfast staple infused with plenty of old-world heritage. Our turkey sausages offer robust flavor from a lower-fat meat, perfect for those looking to cut down on fats without giving up flavor or crucial grams of protein. The Schaller & Weber Turkey Maple Breakfast Sausage is the perfect way to add sweet and savory to your morning meal. Currently only available in 2 lb. bulk packs.